If you have any questions about the Custom Line 124 hull n°4 Yacht information page below please contact us. Launched in 2013, the Ferretti Custom Line 124' #4 yacht is a magnificent vessel, constructed by Custom Line Spa, part of the Ferretti Group. Boasting racy, slender and elegant lines, the Custom Line 124' hull n°4 superyacht is the result of an excellent collaboration between Studio Zuccon International Project and AYTD - Advanced Yacht Technology & Design (Ferretti Group’s research and naval design centre). 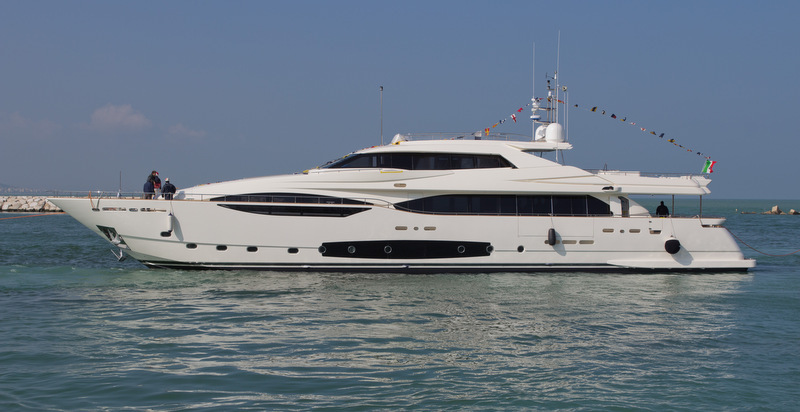 Ferretti Custom Line motor yacht 124’#4 provides her guests with luxurious and comfortable accommodation. The main deck features a spacious Owner area, which is divided into a working zone and the bedroom. There is also a lovely living area, furnished with two large L-shaped sofas with lacquered frame and fabric linings and two coffee tables. To the right is a lacquered solid-wood and leather unit which contains a 52” TV with pop-up system. The lower deck provides four guest cabins. The two VIP double cabins are located astern, while the two cabins with twin beds and Pullman beds can be found towards the bow. All cabins are ensuite with separate shower box. The Custom Line 124' hull n°4 superyacht's professional crew sleep in the crew quarters, featuring a large storage-laundry room and a cabin with desk area for the Captain. There is also a hostess cabin and, at the extreme bow, two twin cabins with bunk beds. Each cabin is fitted with a private head with shower. Twin MTU 3184mhp or 3510mhp engines can propel the motor yacht 124’#4 to the top speed of 27 knots and a cruising speed of 23,5 knots. Built in composite and RINA classed, the vessel has a beam of 7,4m (24'28'') and a maximum draught of 2,4m (7'87''). 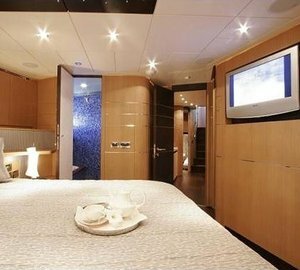 Accommodation aboard Ferretti Custom Line superyacht 124’#4 is provided in a spacious Owner area, as well as four lovely guest cabins, including two VIP double cabins and two cabins with twin beds as well as Pullman beds. We do have available further amenity, owner and price information for the 37.8m (124') yacht Custom Line 124 hull n°4 Yacht, so please enquire for more information. The luxury yacht Custom Line 124 hull n°4 Yacht displayed on this page is merely informational and she is not necessarily available for yacht charter or for sale, nor is she represented or marketed in anyway by CharterWorld. This web page and the superyacht information contained herein is not contractual. All yacht specifications and informations are displayed in good faith but CharterWorld does not warrant or assume any legal liability or responsibility for the current accuracy, completeness, validity, or usefulness of any superyacht information and/or images displayed. All boat information is subject to change without prior notice and may not be current.